We were counting down the days to our trip to Vanuatu so I was in operation Fridge Clean Out mode and eating what we had so nothing went to waste. While riding home from work I was trying to figure out what we could have for dinner as the options were dwindling… but then I remembered I had a trusty can of Ayam satay sauce in the cupboard! Another reason for always having one in your pantry – instant flavour. 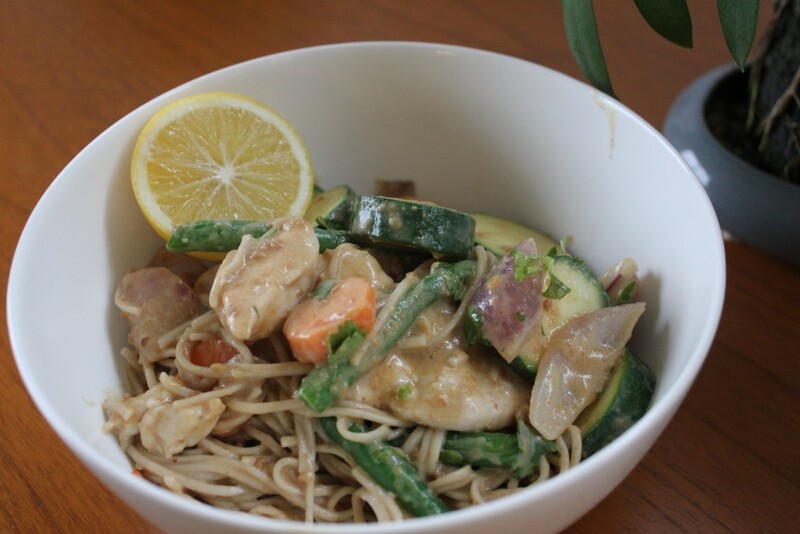 I had a pile of vegetables in the fridge and a chicken breast in the freezer, along with a packet of soba noodles (not super traditional I know, but it was in the cupboard so it would do!) Hello delicious dinner. Heat your wok over a high heat and stir fry the chicken in some vegetable oil until cooked through and browned. Remove chicken to a plate and set aside. Put a bit of oil into the wok and stir fry the vegetables, hardest vegetables first for a couple of minutes and then gradually adding the remaining vegetables until everything is just tender. Remove vegetables from wok and set aside. Pour the satay sauce and coconut milk into the wok, with half a satay sauce can of water. Cook for a couple of minutes until boiling and slightly thickened. Season with fish sauce and lemon/lime if necessary. Add the chicken, vegetables and cooked noodles (if using) back into the wok and toss until everything is coated in sauce. Serve with chilli and lemon/lime on the side.